Today I wanted to talk a bit about my R package building experience and showcase some of the things that really helped me out! When I first proposed we turn our set of bullet chart functions into a full-blown package I noted that I had a lot of preparation to do. The first source of information I looked into was of course, Hadley Wickham’s “R Packages” book! After confirming with Amit that we will work on this exciting project, I proceeded to read most of it in the weekend that followed. From chapters on documentation to compiled code it gave me a good overview on what I needed to do and I frequently referred back to it throughout the package building process. For most of my time working with R, I was mainly doing things by/for myself; Doing projects to showcase on my blog, doing analyses for my dissertation, etc. So this was also a great opportunity to collaborate on a R-related project for the first time. As I’m in Tokyo and Amit is in London, our communication was purely online as we bounced ideas off each other and let each other know of issues and possible ideas not just through Skype but also through commit messages and Git repo issues. 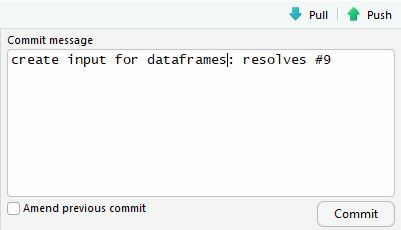 A handy trick I learned was that you can close and reference Issues in the commit message! To see a full list of the keywords to close an issue check this help page! Recently I saw this article which talked about using the Git Bash console for handling your version control. Although the RStudio Git Hub panel is quite good and gets the majority of things done (indeed, I still use it most of the time), sometimes, as I’ll show below, may necessitate learning how to use Git through the console as well! Just for the sake of being thorough, here are the steps to check your repo, stage any changes, commit with a message, and then push to origin (make sure you have Git installed on your computer first)! git status to check whether your branch is up-to-date with origin/master, look at what files are unstaged, etc. git commit -m "my git commit message here", pretty self explanatory, main thing is the -m to add a message! This isn’t the best way to add a commit message/title as you can’t make new lines and go into great detail. 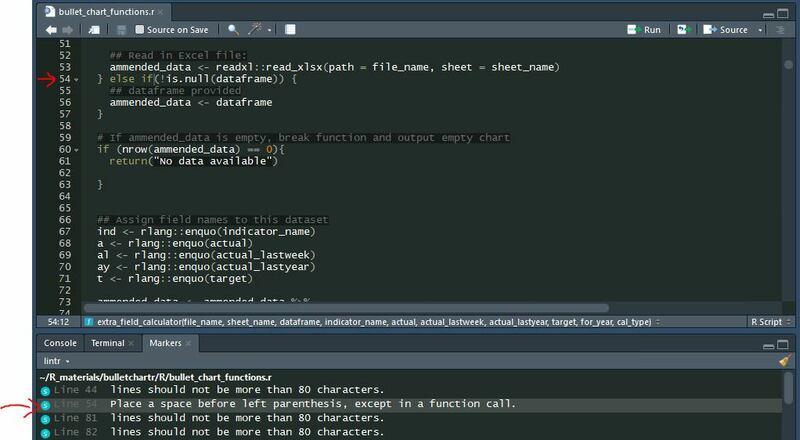 Bottom line is don’t just use the RStudio Git Hub panel! Practice and master using the console to have better control over what you push, pull, commit, revert, etc.! Building the internal “calculation” function: To reduce the work that the user needs to do and to avoid repeating the calculations every time for each bullet_chart_*() function, we decided to have all the calculations be done by an internal function. The function transforms the various input values into percentages in relation to both the target and time of the year as well as creating the custom labels for the plot. Building the plotting functions: The bulk of the plotting code came from setting the aesthetics of the various geom_col()s as well as extensive usage of theme() to set up the textual information. Most of the time taken for this part was figuring out the layering order as well as figuring out how to best implement the intuitive defaults for options such as “legend”, “small version” (so one could preview the bullet charts in the windowed RStudio Plots panel without having to open it up in a new window), and “fiscal calendar type”. More features will be added in the next versions! Working on bulletchartr was the first time I used tidyeval, I’ve been hearing about it for ages but usually skipped over reading articles about it as I really had no clue what was going on. My first real introduction to it was Hadley’s talk on it at the RStudio Conference a few months ago. To make it easier for people to use the functions we used tidyeval to allow users to import data sets/excel files with their own column names. Then in the function call we ask users to specify those column names to the corresponding bulletchartr column names through tidyeval. When a user enters their own variable names into the arguments, under-the-hood the bullet_chart() function uses enquo() to quote them and turned them into quosures. These quosures allow the function to capture user input as an expression. 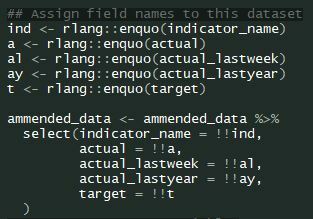 Then, when these are called to create the data frame (still within the function), we use the !! operator to “explode” them as variables without quotations. so that they’ll be properly read and used by the function to turn them into the columns for our data set. Here is a great vid from RStudio that really made me understand tidy eval after multiple failed attempts, especially if you didn’t understand my explanation above (sorry, I’m almost to the point of being able to explain it in my own words)! What’s the point of having a nice package if people have no idea how to use it? To make the documentation process easier to help both users and authors is the roxygen2 package! With this our documentation is in the same place as our functions so we won’t forget to update them whenever we change bits of code! As an added bonus, we no longer need to manually change the man files. All we have to do is add new comments above our code with #' at the start of every line and then roxygenize()! In addition to this, the add-in “createOxygen” from the sinew package allows you to automatically create a nice template or “skeleton” of the type of topics that should be in a help page. All you need to do is to run your function once to commit it to memory, highlight the function name, then click createOxygen from the Addins tab in RStudio to create a roxygen template that is ready-to-go! Style your code with lintr! Other great packages include styler, which will automatically style your code (according to the tidyverse formatting rules) as well as the Lintr Bot which will comment on Pull Requests for R Packages on the Git Hub repo if you have a lintr unit test in it! # create testing infrastructure: "tests/testthat.r", "tests/testthat/ folder"
DESCRIPTION file: One example of something to be careful about here is to make sure you have the correct version of dependencies in the IMPORT section as well as having the correct >= or > signs. Bugs: I ran into a lot of bugs in my code. Some that I made were things forgetting a comma to separate function arguments and mixing up when to use = or ==. Others like not placing certain arguments inside or outside aes() as well as making sure I had the geoms, themes, etc. in the correct order! Though a lot of these are small silly mistakes, they can become increasingly frustrating as they begin to pile up, especially when you’ve been working on stuff for a few hours! When silly mistakes start popping up regularly, it might be time to take a bit of a breather, relax! License: I ended up just choosing what ggplot2 had as our code is mainly based on that…! Remember to read documentation of packages you’re using as dependencies for your own package! Here’s a good website for comparing licenses. Just because you released your package doesn’t mean you can just sit back and relax, the real work begins here! 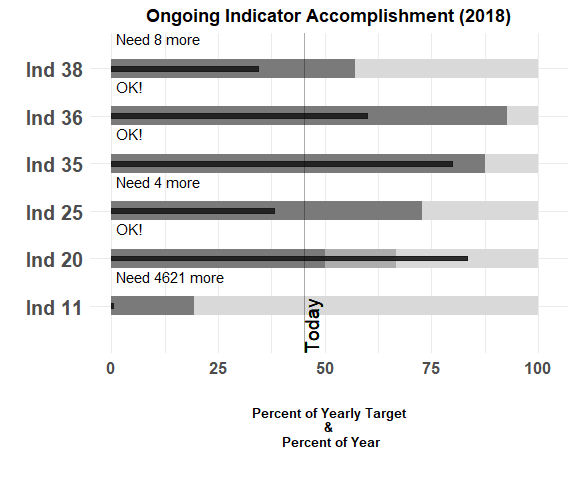 Immediately after our first mini-release, showcasing our bullet charts to the various project managers at ACDI/VOCA, we got feedback on several issues along with a few things we noticed we were lacking. One of those things was cutting down duplicate code in our plotting functions for when we incorporated the small and legend options. This was important because as we develop this package further, we don’t want to be changing code in multiple places to keep everything consistent. As I’ve said many times throughout this blog post, we want to make things easier for ourselves and any collaborators in the future! Another important thing to note when creating a package/set of visualization tools for a client (in this case the various project managers at ACDI/VOCA) is that you need to be flexible towards the concerns of the end users. What’s important is not what you, personally, think is the best visualization strategy or presentation but to think from the perspective of those who will actually be using the product/package/service on a daily basis, post-release. An example of this is concerning having legends in the plot. From my perspective, I thought it would really clog up the visualization, so I opted to do away with them all together especially since the graphs were quite intuitive (and a legend would be redundant, again in my opinion). However, the end-users really wanted them so after a quick discussion we added them in as an option, legend = TRUE/FALSE! Currently I am trying to fix a few things up but you should still be able to download via devtools::install_github("ACDIVOCATech/bulletchartr") and try it out! I should have finished this article a few weeks ago (when we actually released the alpha version along with the ACDI/VOCA blog article) buuuttt…. life happens! While its important to take heed of this article concerning timing your PR/marketing with your product releases, I say - well, better late than never! Next version will allow full customization of the bullet_chart variables courtesy of tidyeval, as in you don’t have to only use proxy variables such as “last year” or “last week” and you could maybe make your own bullet_chart graph with “daily” as your time unit! The alpha version is quite limited in what it can intake and output at the moment but improving that is the main goal for the next version! Hopefully this recollection of random tips, tricks, and my thoughts of my package building experience can be helpful to would-be novice package developers in the future. This was a great experience for me and I hope to create more R packages in the future!